On a firearms discussion board, a new participant asked for instructions how to draw a gun. 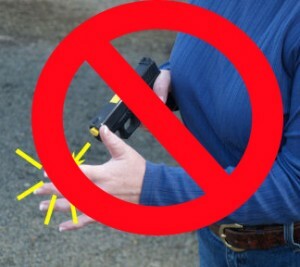 During the discussion that developed, one of the more clueful participants pointed out that a simple drawstroke, when done wrong, could result in shooting one’s own hand. Putting a hand in front of the muzzle during the drawstroke feels fast and natural. It’s also very dangerous. As an instructor, I spend a lot of my time pointing these things out to good people who honestly don’t realize what they have just done dangerously. People put their hands in front of the freaking muzzle all the time without realizing it. When someone else points it out, they are often bewildered, and then grateful. That’s one of the primary benefits of going to a good class: we learn how to not repeat the bad habits of people around us, and we get a trained set of eyes looking at what we actually do. Our brains don’t always give us an accurate report from the inside, so having well-trained eyes looking at what we’re doing from the outside can become a hugely valuable resource. The injuries from shooting a hand range from surprisingly mild — a simple through and through of the meat — to lifelong and crippling. “Degloving” is such a wonderfully descriptive word. It’s also the most dangerous thing most people ever do with their firearms, and all too many of them do it without any understanding of the dangers involved.